Mediterranean Fresh is a collection of one-plate salad meals, plus a variety of dressings. The book is full of lovely, fresh offerings: green salads with sauteed mushrooms or poached eggs, parsley salad with tahini, roasted red pepper salads, figs with almonds and greens, you name it. Chef and author Joyce Goldstein draws on the flavors of southern Europe, North Africa and the Middle East, and the results are gorgeous. This book seemed like an excellent choice for August. Not only is salad a great choice for a warm night (well, today was a bit cooler than we’ve been, but still warm), but the Greenmarket is teeming with choices. I settled on two salads to try — Greek country salad and peach and tomato salad — and hit the Wednesday market near work during my lunch break to find tomatoes, green peppers, peaches, red onions, lettuce and cucumber. 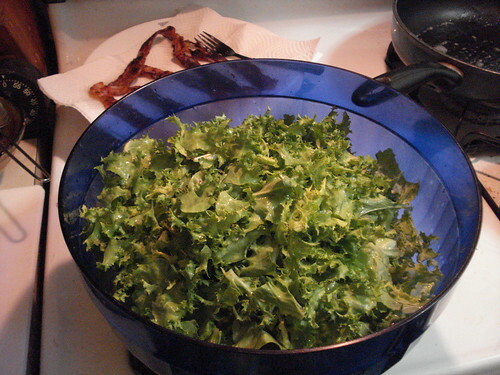 You may recall that I made a tossed salad the other week. 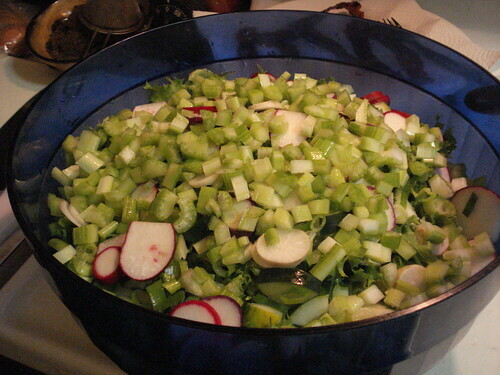 I do not usually toss salads together, because I hate it when the cucumbers go bad and spoil the rest of the bowl. 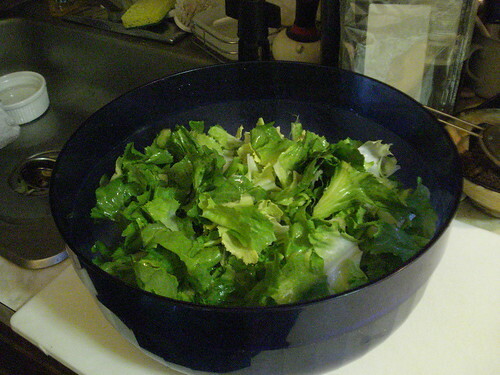 That’s exactly what happened to the Supper Salad Bowl, so I determined not to let it happen again, and kept the ingredients separate to combine only at the plate level. I’m not sure I had to worry as much this time, though; we’re going to want to polish off the Greek country salad a lot faster. 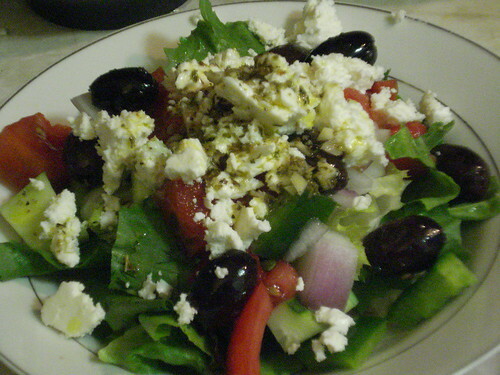 The Greek country salad is fairly simple: lettuce, tomatoes, cucumber, green pepper, red onion, kalamata olives, and feta. 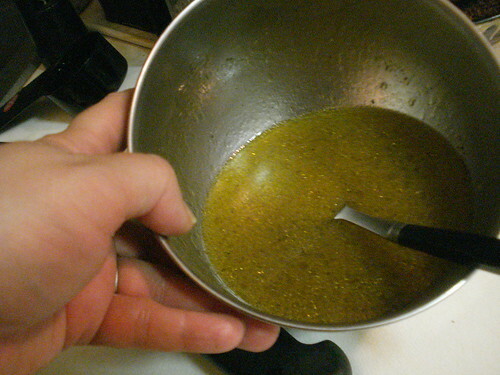 The oregano garlic vinaigrette is pretty easy as well: olive oil, red wine vinegar, dried oregano, garlic, salt and pepper. 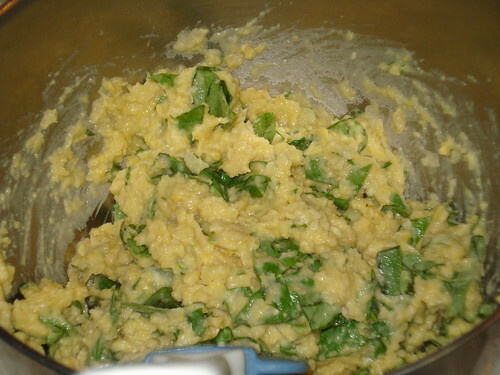 The recipe recommends that if you have time you should warm the dressing slighly to intensify the flavors; this would probably make them very intense indeed, as the dressing at room temperature is really flavorful and a good complement to the salad. Even my husband liked it, and he’s not usually a fan of salad dressing, though this is clearly superior to any bottled, preservative- or sweetener-filled concoction. 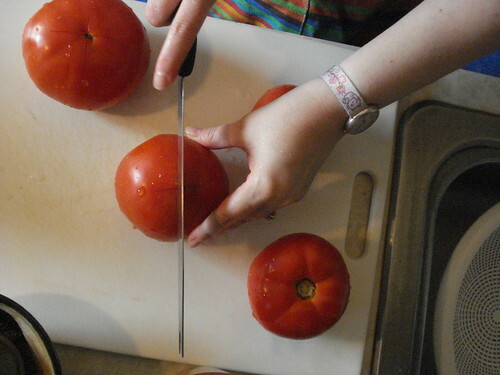 The peach and tomato salad is also simple to make, but presents very complicated flavor combinations. 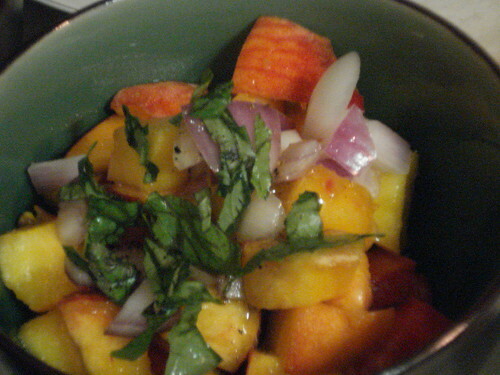 The salad itself has only four ingredients — tomatoes, peaches, red onion and fresh basil — and is topped with a dressing of orange and lemon juice, olive oil, salt, and coarsely ground black pepper. The contrasting flavors play off each other. 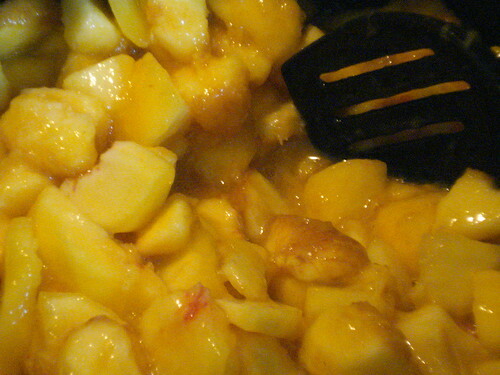 A mouthful of peach and onion together is exciting; a taste of peach and pepper is revelatory. It’s the kind of salad that deserves to be slowly nibbled and savored, but that you can barely stop yourself from gobbling down, it’s so good. Verdict: Success. I’ve been doing a good job of bringing leftovers for lunch this week but tomorrow will definitely win the prize. Three Bowl Cookbook is a collection of recipes from the Zen Mountain Center in the San Jacinto Mountains of Southern California. The book places the recipes in the context of a Zen Buddhist lifestyle, which can be pursued through devotion to a monastic life or by simple focused awareness and intention throughout the daily course of an otherwise mainstream life. The three bowls of the title are the standard serving vessels of the monastery, one large and two smaller; the three recipes for each meal are chosen to complement one another and form a balanced, seasonally appropriate whole. You certainly don’t have to be Buddhist to appreciate the offerings in this cookbook. Roasted vegetables, grain salads, savory greens, refreshing beverages, fruit compotes, and soups are spotlighted in appealing photos. The recipes are interspersed with Zen proverbs and anecdotes from the center. I picked up the book several years ago and can hardly believe I’d never gotten around to using it. 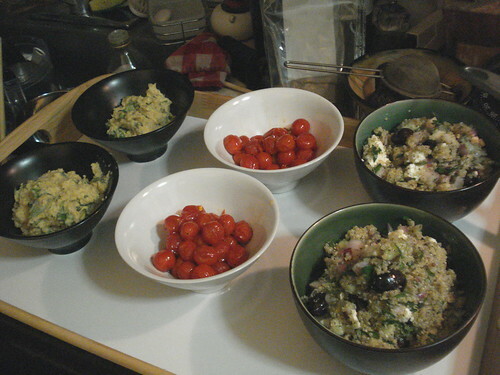 Since it is most definitely summer here in New York, I turned to the summer section and opted for quinoa tabbouleh, sweet sauteed cherry tomatoes and basil hummus. 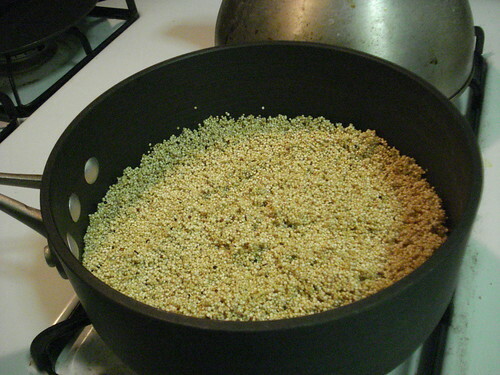 The quinoa is for the big bowl. 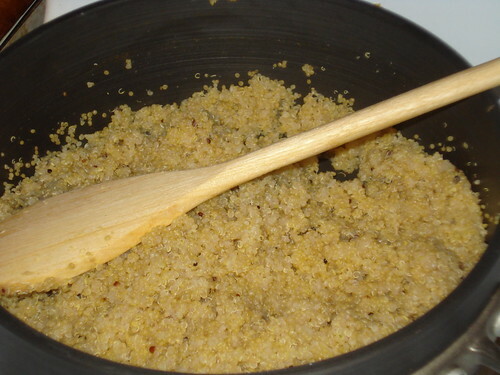 Quinoa is a South American grain that comes in tiny dried pellets, and cooks up to a fine-grained, high-protein base for salads and mixtures like this. 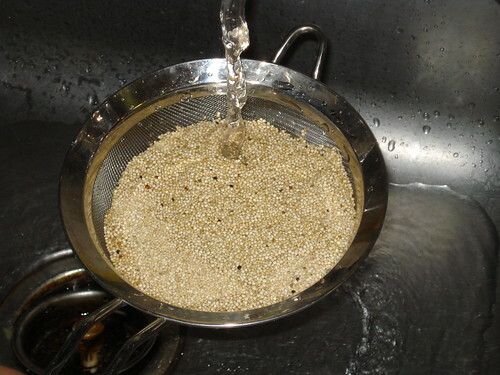 I started by rinsing the quinoa well, to eliminate a residue that can give it a bitter taste, then browned it in a heavy pan before adding water and salt and cooking until the water was absorbed. 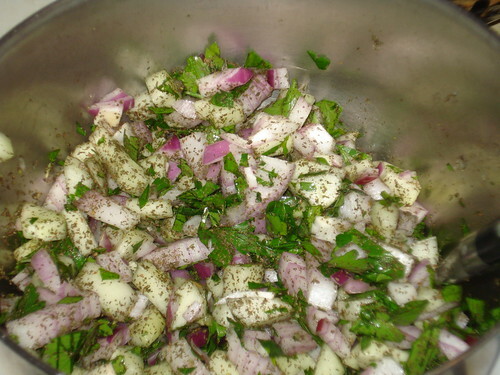 Meanwhile, I diced a cucumber, a red onion, and some parsley; here we come to my first substitution for the dish, since I found I was out of fresh mint and had to use dried instead. 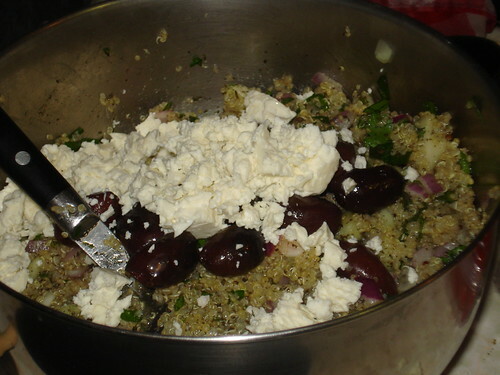 When the quinoa was cooked I set it to cool, and whisked together a dressing of fresh lemon juice and olive oil. 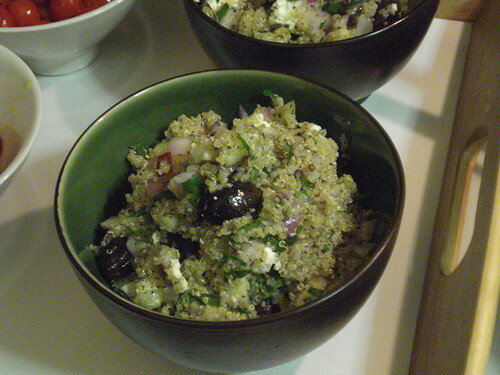 I mixed the dressing with the cucumber mixture and the quinoa, and added some kalamata olives and crumbled feta. 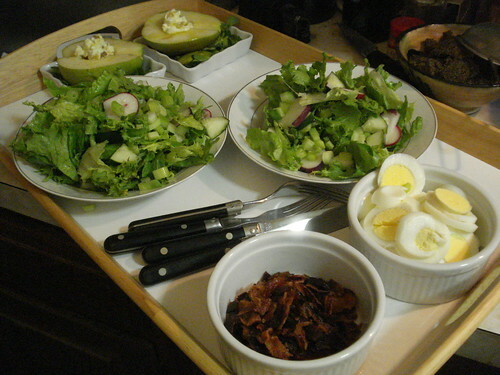 The resulting salad was delicious: hearty, savory and refreshing. I will definitely be making it again. I had to do more adaptation with the hummus, first because I had neglected to notice that the recipe directed you to start with dried chickpeas instead of canned (too late to switch by the time I caught that), then because I found I had only one can of chickpeas. 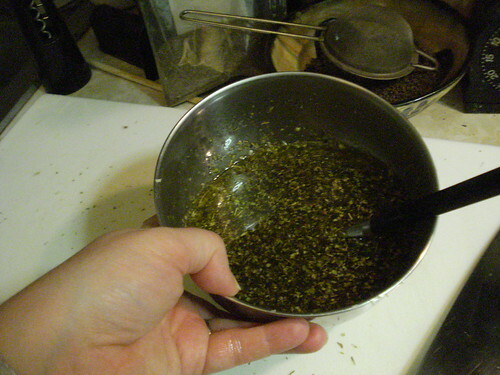 No problem, I thought; I’ll just halve the other ingredients, which were garlic, lemon juice, olive oil and basil leaves. 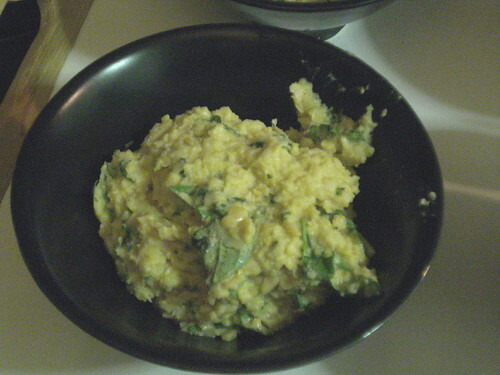 I was still a little nervous, but as the food processor whirled everything but the basil leaves together I relaxed, as it became evident that the consistency would be right. And so was the taste. 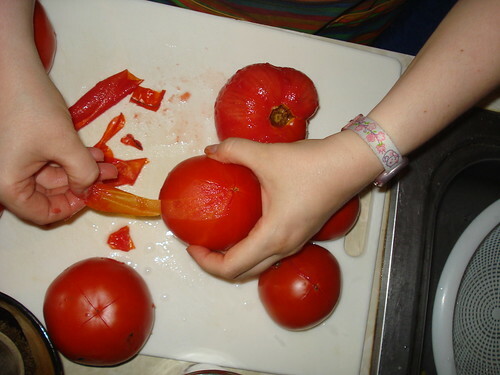 The last thing to prepare was the tomatoes, partly because the recipe directs you to serve them immediately, partly because they took virtually no time. 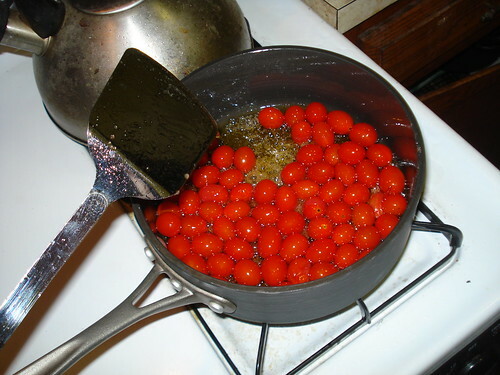 I heated some olive oil in a heavy pan (as it happened, the same one from which I had decanted the cooked quinoa), then threw in cherry tomatoes; after I’d tossed them briefly I added sugar, which made for a sort of piquant glaze. 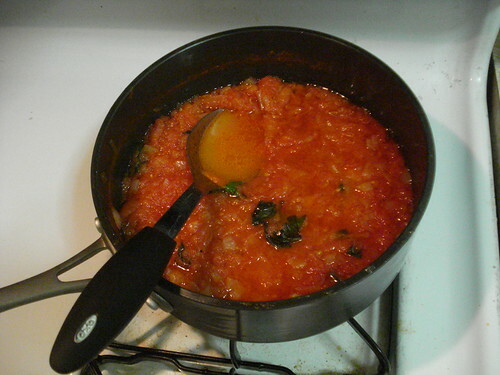 I realized as I tossed the tomatoes that while I’d gotten the proportion of oil to sugar correct I had half the tomatoes called for, so there was quite a bit of syrup left in the pan. 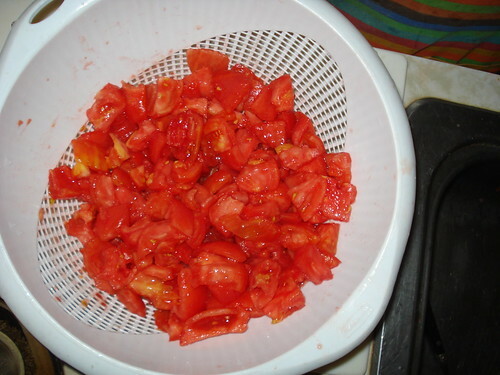 The tomatoes were delightful; the sweet coating brought out the rich and pungent tomato flavor, though the dish may have been a bit sweeter than intended. Verdict: Success. 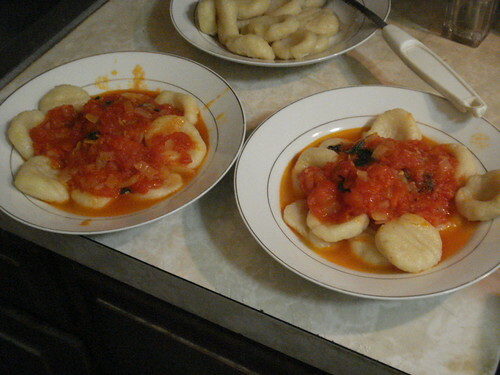 I’ll make this again, and perhaps I’ll learn to count in the interim. And I will definitely try menus from the other seasons at the appropriate time. I cannot say that I found enlightenment, but I found a measure of delight, and that is enough for me most days. 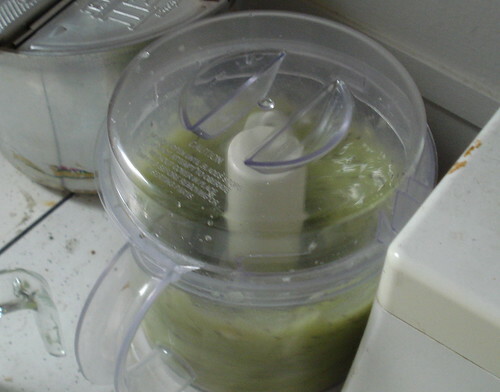 I used the follow-up volume, Super Smoothies, in July, and now am turning to Smoothies. I don’t know why I took them in reverse order — some last-minute juggling of cookbooks, no doubt. This slim volume offers 50 fresh and drinkable recipes, on pages that are mostly readable. A book designer got a little overenthusiastic with these two books; it is really not necessary for pages to feature bright background colors and for type to be pale and hard to discern. Happily, the kiwi kiss fell within a series of pages that used black type. 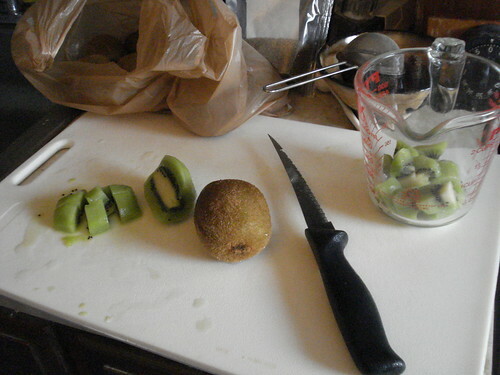 Kiwi kiss is simple: dice 1 3/4 cups of kiwi (about 3, peeled) and 1 cup of honeydew melon, and put it in a food processor with 1 1/2 cups of lime sherbet. Only I didn’t actually have lime sherbet, because I couldn’t find it at the neighborhood grocery store. I might have been able to find it if I’d trekked to the other stores in the area, but then again I might not have, and when it’s about 90 out I lack the patience for such investigative rambles. 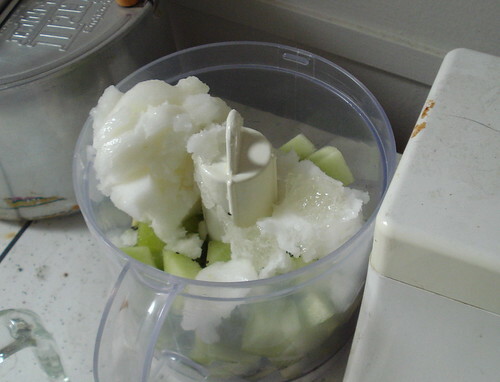 So I improvised: I used lemon Italian ice and added a squirt of lime juice. 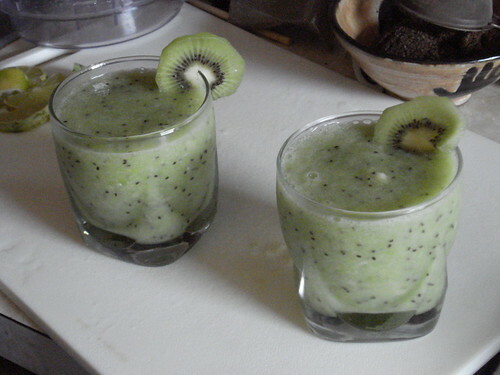 The smoothie tasted great, and was pretty. 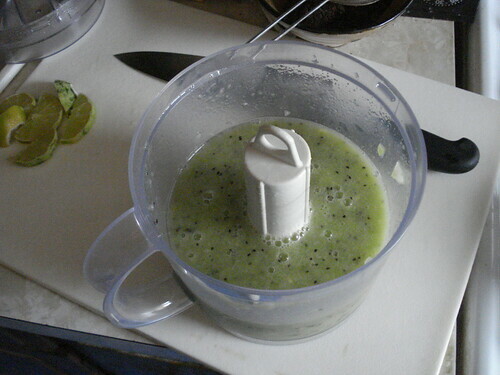 The recipe advised using a food processor instead of a blender to minimize the chance of crushing the black seeds, which would impart a bitter taste to the drink. It must have worked: no bitterness here. Verdict: Success. 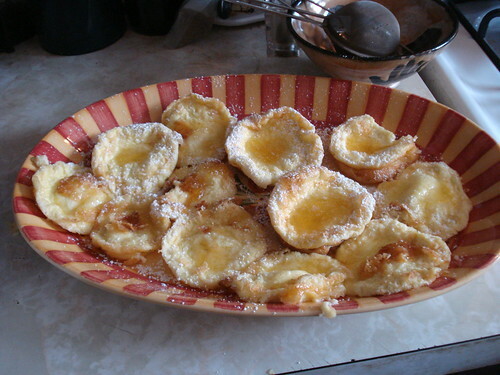 I’ll have to try some of the other recipes before the summer is out. This time I only took one more picture than I ended up using in my blog post. 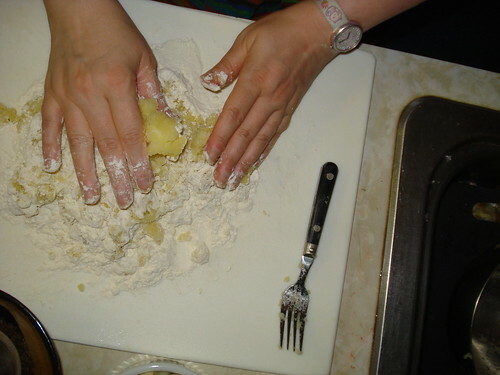 But did you know I usually take a lot more photos when I prepare these recipes? You can see the whole set here on my Flickr page, and you can leave comments there as well if you like. 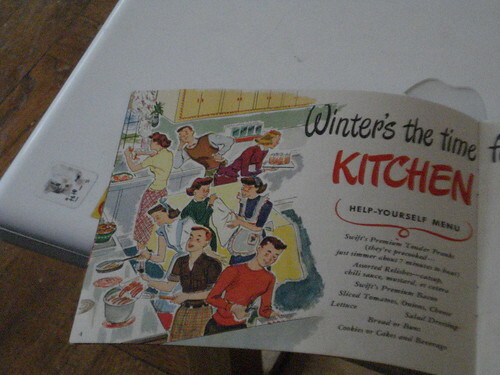 Modern Homemaker appears to be a magazine* from Kerr Glass Manufacturing Corp. (now owned by Ball), so it’s not too surprising that it devotes most of its attention to home canning. On an introductory page, editor Zella Hale Weyant notes that while the war and its demands for food rationing and shared sacrifice have ended, the future of the nation’s food supply is far from certain. What Weyant did not know is that in the years to come, petrochemical companies would convert their wartime product lines to chemical fertilizers and pesticides, leading to the industrialization of American agriculture — greatly expanding the country’s food supply and choices, but at a cost to individual health and the environment that we have barely started to come to terms with. In the meantime, Weyant recommends that homemakers continue to preserve the bounty of their home gardens through home canning. The magazine gives recipes for jams, jellies, preserves, fruits, vegetables, meat, and fish, as well as dishes one can make with the canned goods. 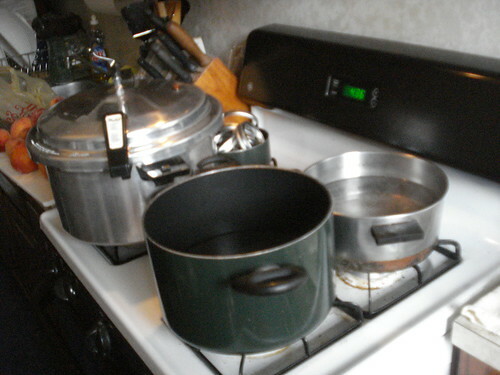 There are also instructions for using the hot-water-bath and pressure canning methods for various foods. 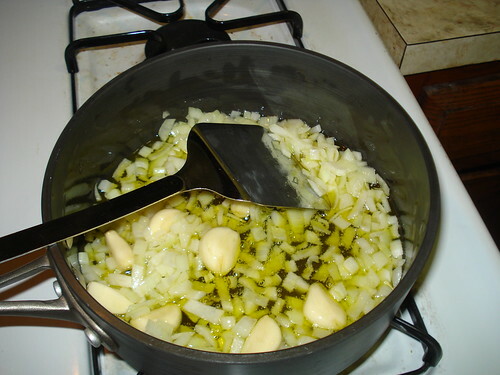 I have a pressure cooker, but am missing the pressure gauge, so I have not been in the habit of canning low-acid foods that require pressure. 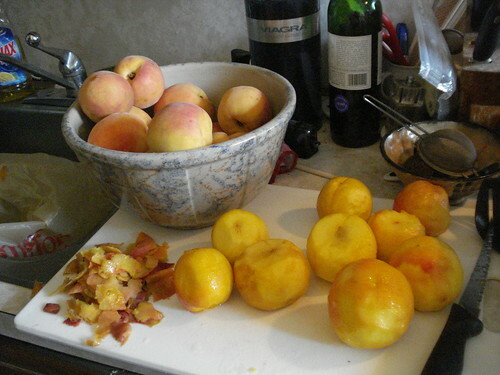 I opted to make peach jam, partly because I thought it would be fairly simple and partly because I love peaches. My original plan was to go out Saturday morning to the neighborhood Greenmarket to get fresh peaches, make the jam, then go about my day. 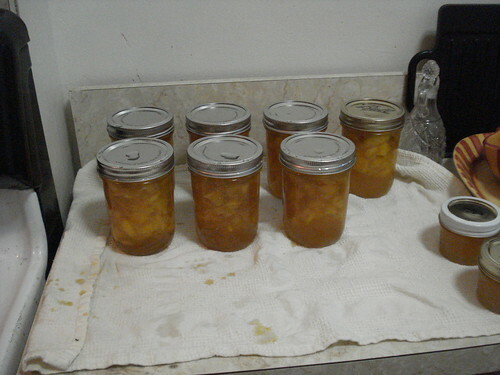 I got the peaches home and found that I did not have the right size canning lids, so I decided to make jam in the afternoon after I’d bought lids. This turned out to be just as well; the process took longer than I thought, and my husband would have been pretty impatient to start our usual weekend brunch trip by the time I was done. 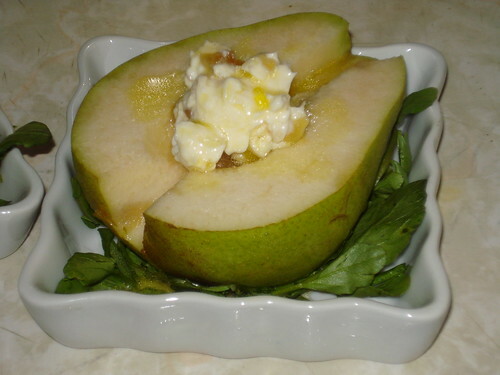 Cut well ripened peaches into small pieces. Put into large kettle without the addition of water. Cook slowly about 20 minutes or until peaches are slighly softened. 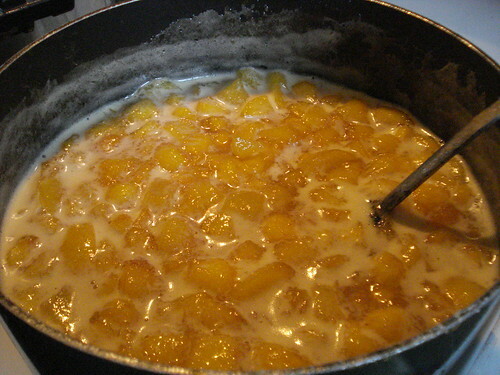 Measure peach pulp and for each cup of peaches add 1 cup of sugar. 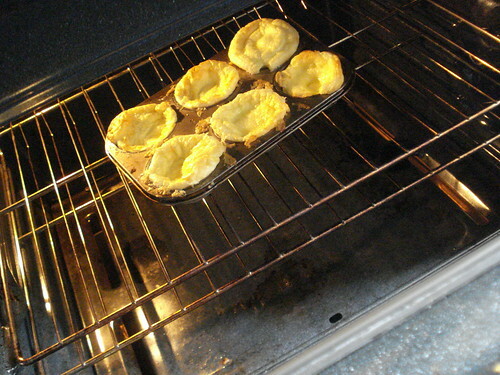 Return to fire and cook until of desired consistency. 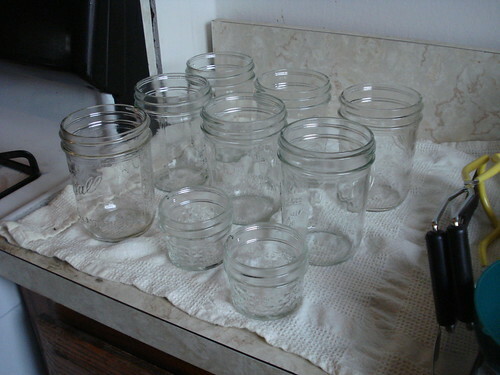 Pour into sterilized KERR Jars and seal while hot. I opted to peel the peaches before chopping them, which took a fair bit of time I hadn’t accounted for. 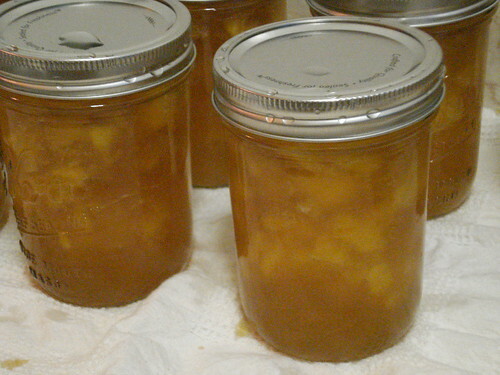 Peeling peaches is not particularly difficult: cut an X across the bottom of the peach, then dunk it in boiling water for 30-60 seconds, and the skin will be loosened and should be easy to pull off. 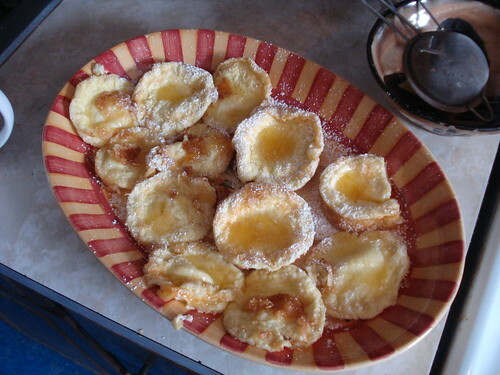 A few of my peaches were underripe and hard; I re-dunked those, thinking perhaps I had just not given them enough exposure, and now they were still hard but also too hot to handle easily. 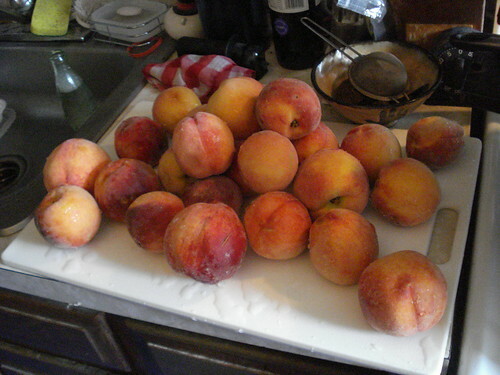 I set them aside to cool while I cut up the rest of the already-peeled peaches, then used a knife to pare them before chopping and adding them to the pot. “Cook slowly” is a nice, general instruction, isn’t it? Obviously not on high heat, but how low is slow? By the time the 20 minutes were up my peaches had broken down quite a bit and given up a significant amount of juice, but I’m not sure if that means my heat was too high or if I did it just right. 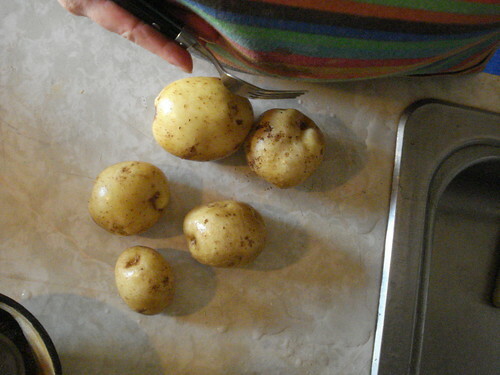 To measure them I dumped the whole potful into a heatproof bowl, then poured cup after cup back into the pot, counting as I went. 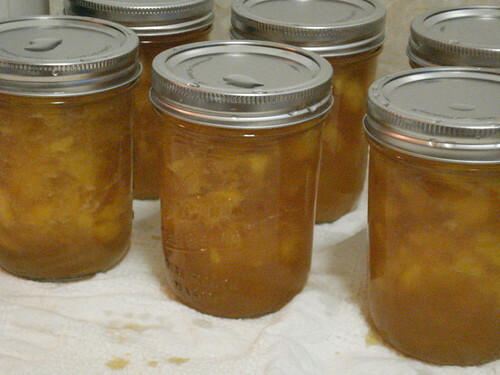 The 24 peaches I’d started with produced 10 1/4 cups of fruit and juice, so I added 10 1/4 cups of sugar, and then cast a worried eye at my seven pint jars and two cup-sized jars; would 20 1/2 cups cook down to 15 cups of jam? For that matter, was that too much sugar? 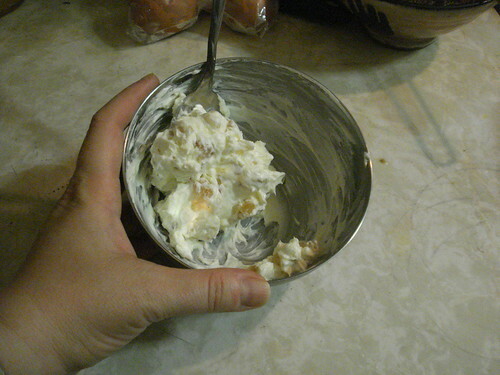 It looked like an awful lot at first, and my initial tastes of the mixture once the sugar had dissolved were more suggestive of peach candy than peach jam, but as it cooked the flavor balance shifted again and the peaches were the dominant taste. And of course sugar has a preservative effect here. It’s possible that I could have reduced the amount of sugar, but I don’t know enough about the chemistry involved to be sure how much I could eliminate before the acidity would be insufficient for canning safety. I suppose I could have experimented to find out, but I wasn’t willing to do so at this point. 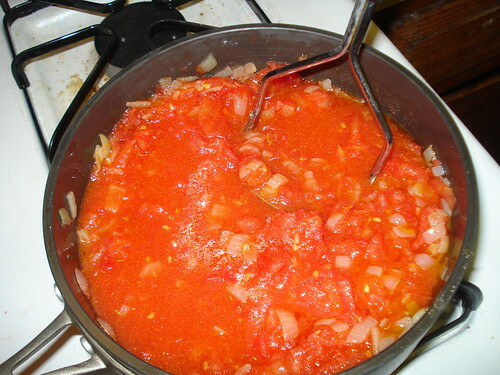 Another vague direction is “cook until of desired consistency.” It’s a bit tricky to know what the desired consistency of your hot and bubbling jam should be, because the final product will be thicker once it has cooled after canning. I kept cooking and cooking, probably about 25 minutes, stirring and simmering until the mixture felt noticeably thicker than it had before, and I tried the old-fashioned plate test: I dribbled some on a plate and held it at a slight angle, and when the dribbles were thicker and slower to run, I decided that would do for me. And I was delighted to find that my jam fit almost exactly into the jars I had available. Now it was time to seal the jars. 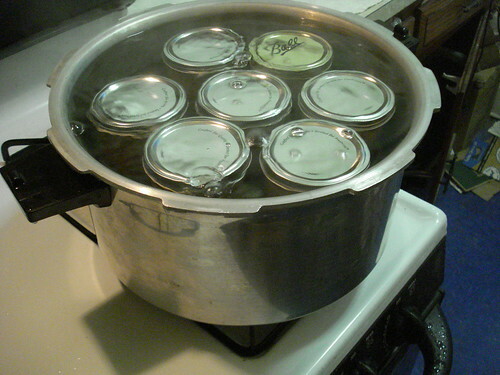 Jam takes hot-water-bath canning, but I thought I’d use my pressure cooker since it’s broad enough to hold all seven pint jars at once and I didn’t want to have to do two batches. This worked out well, except for the fact that even though I did not have the lid latched closed, it still sealed, and I had to vent out the steam to be able to open it when cooking was done. This was quick and easy — raise the valve — and safe enough with the aid of a potholder, but it made a dramatic hissing sound, and the cats were not impressed. I was impressed by the jam, though. It shone golden and glorious, with lumps of peach giving it a rustic character. 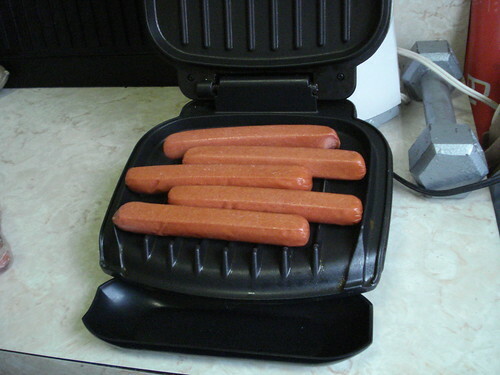 We had some with toast this morning and it tasted wonderful. The two cup-sized jars did not fit in the canner so I’m storing them in the fridge; I don’t think we need to worry about using them up before they go bad. Verdict: Success. It took me a while to get there, but the results were well worth it. * But it counts as a cookbook for my purposes because I don’t have any of the rest of the run. 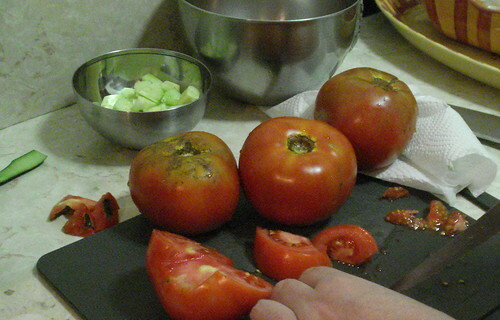 I’ve finally had time to organize my thoughts about Michael Pollan’s NYT essay “Out of the Kitchen, Onto the Couch.” Check it out at Recipes of the Damned. Health-For-Victory Club Meal Planning Guide is a 1943 pamphlet from the Home Economics Institute of Westinghouse in Mansfield, Ohio. 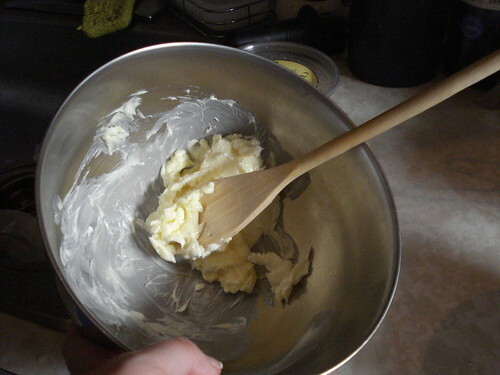 So it brings together wartime scarcity and rationing with the precepts of early-20th-century home economics, which means a lot of things with white sauce. 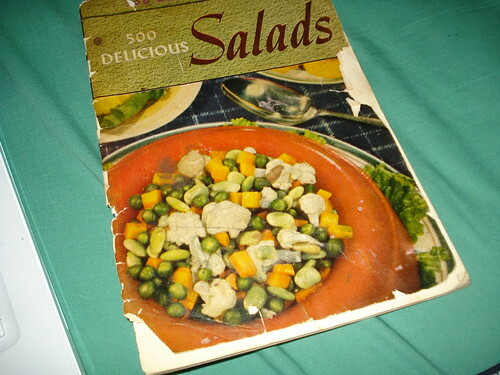 In all fairness, the majority of the recipes are reasonably wholesome, and cover a wide variety of dishes. The quick bread section includes blueberry nut bread, French toast, corn bread and griddle cakes. Cakes and cookies include gingerbread, oatmeal cookies and lemon molasses cupcakes. There are rarebits, chicken fricassee, cherry dumplings, peach shortcake, and chicken and noodles, as well as the intriguingly named “macaroni hoe.” (It appears to be a robust mac and cheese souffle with an egg base, flavored with green pepper and pimiento.) There’s also a section on dehydrating and brining food to preserve your garden’s output, and tips on making the most of your ration points. And there’s a lot of very sound nutritional advice (such as saving the cooking water from vegetables to use in soups, or relying on beans and nuts for your protein when meat is scarce). I don’t know if I’m just unusually sensitive to summer heat (this is very possible) or if cultural standards have changed, but the June 1943 book seems to have a lot of heavy, hot and starchy foods for the season. 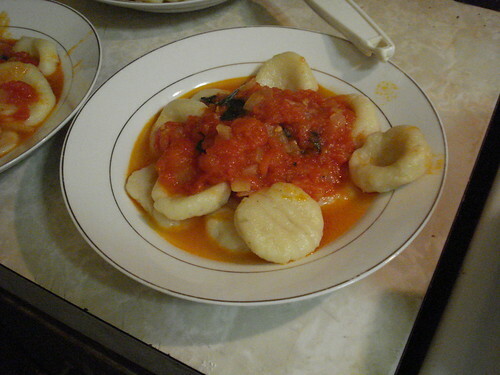 Fruits are stewed; hot cereals are offered; macaroni stars in a lot of non-salad dishes. I didn’t realize this when I was scheduling the various cookbooks, so had to dig a bit to find something suitable for the August heat. 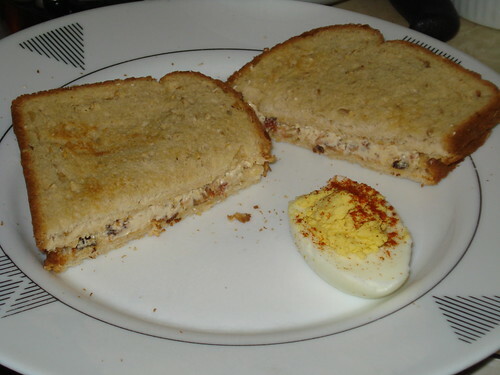 But I came up with two recipes that worked well for a cold supper on a warm night: deviled eggs, and bacon-and-cream-cheese sandwich filling. The sandwich filling was pretty easy. 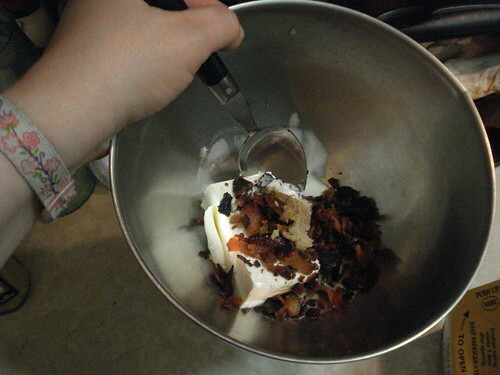 I cooked yet more bacon (at this rate I need to buy stock in Ajax Dishwashing Liquid) and chopped up enough for 1/4 cup; I mixed this with 3 ounces of cream cheese, plus a bit of horseradish, Worcestershire sauce and milk, then chilled it until it was time to spread it on toasted bread. It tasted good. 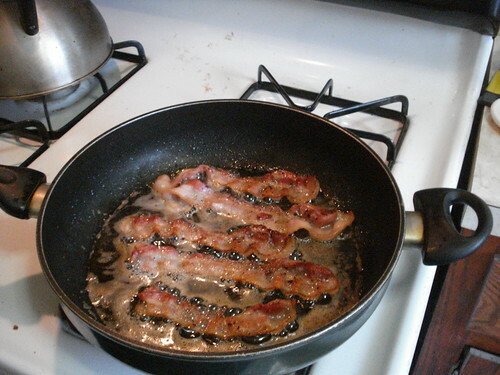 (Is that surprising when the major flavor element is bacon?) 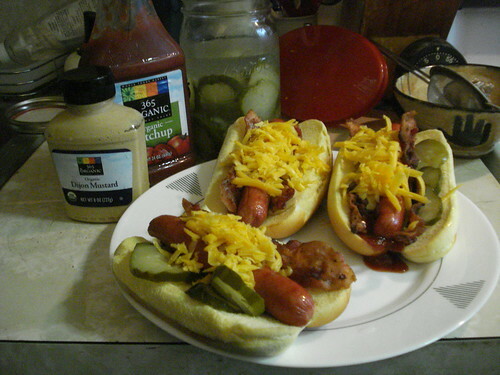 The recipe produced enough for three moderate sandwiches or possibly two generous ones, but we went with moderate. 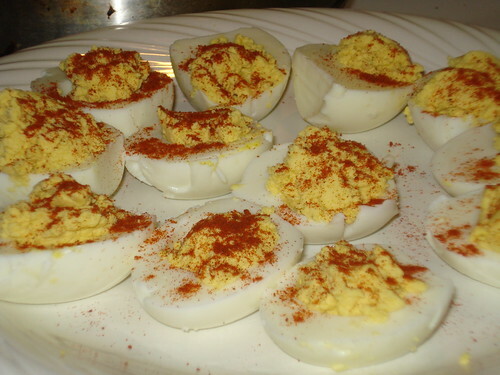 The deviled eggs were a bit more work. 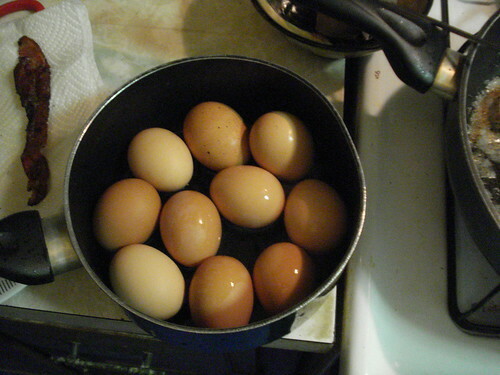 I followed the booklet’s instructions for hard-cooking the eggs: put the eggs in a pan and cover with cold water, bring to a boil, and simmer 5-8 minutes, then drain off the hot water and rinse well with cold to stop the cooking. 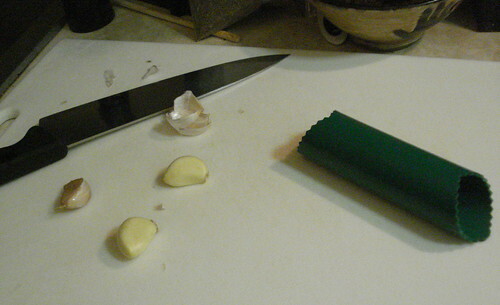 At this point the smart thing to do would have been to immediately peel the eggs under cold running water, but I was cooking them a day ahead and so put them into the fridge in the shells. 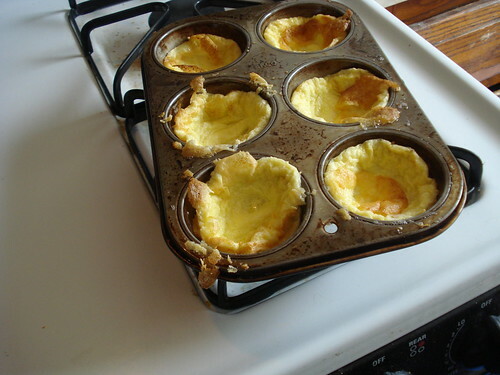 This meant that despite the fairly generous air pocket at the end of some of them (a sign that the eggs were not perfectly fresh, though they were still quite good), the shells did not come off too easily when I did peel them. 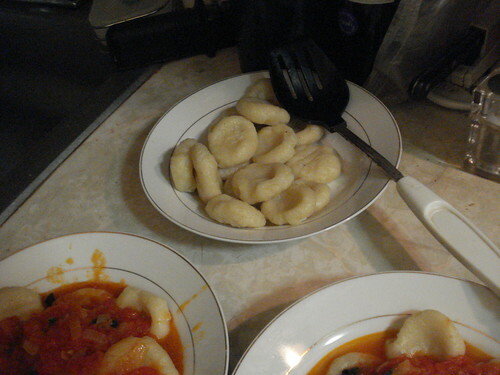 I didn’t utterly mutilate them, though. 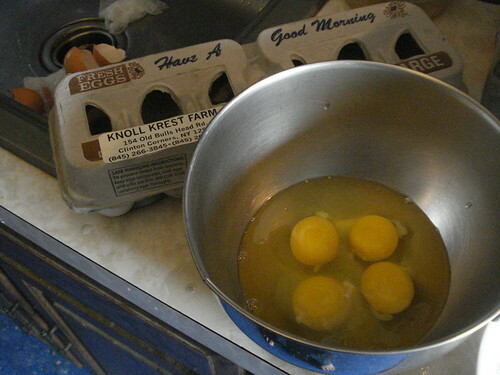 Once the eggs are peeled, they should be cut in half lengthwise, and the yolks pressed through a sieve into a bowl. 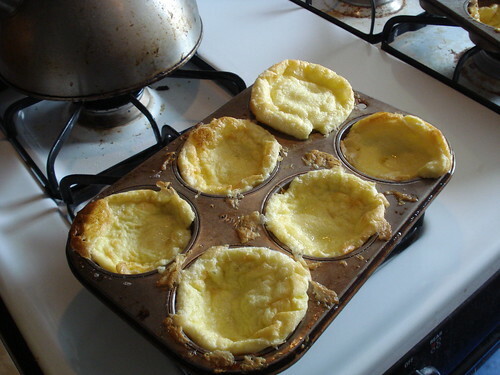 I used a finer sieve than I think was intended, so it took a bit of time and didn’t do much good for the sieve, but it did make for a nice fluffy filling and no big chunks of yolk. 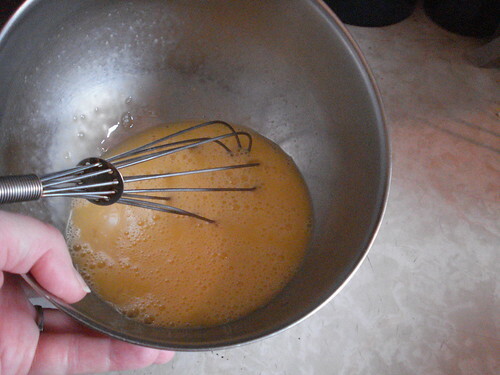 Mix the sieved yolks with some cream, vinegar, mustard, Worcestershire sauce, salt and pepper, and beat the mixture until fluffy. Or, in my case, until you get impatient to get on with it. 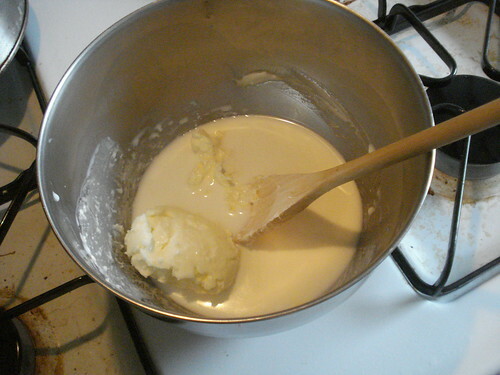 Scoop the yolk mixture back into the egg halves. You could use a pastry bag to make it pretty, but I didn’t bother. 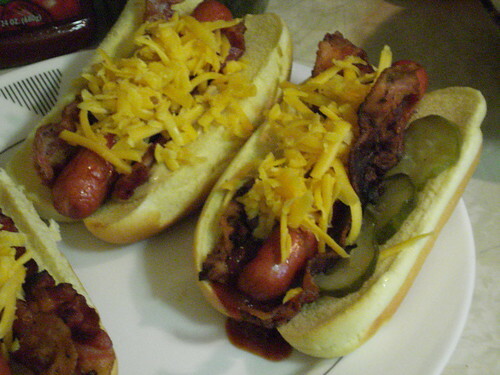 Garnish with paprika or chives. The deviled eggs tasted good. I wouldn’t say great, but then I’m not really an aficionado, so it’s an uncommon deviled egg indeed that will have me singing its praises. I was perfectly happy with them. 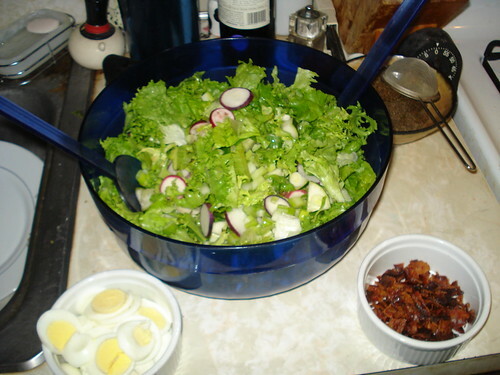 I served up the sandwiches and eggs with a sizable green salad, on principle. Verdict: Success. 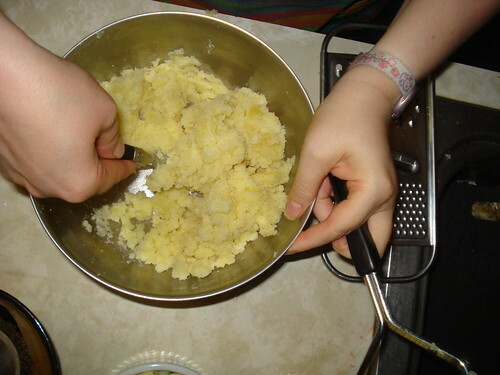 The recipes were not complicated, and the instructions were clear and accurate. 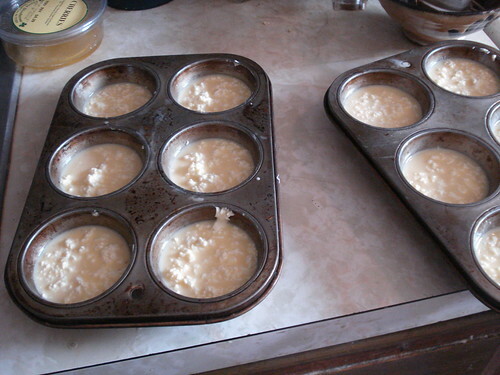 The results tasted good. 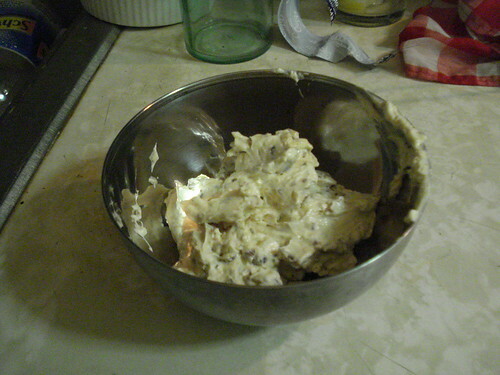 The bacon-cream-cheese filling certainly does a good job of stretching the serving of bacon; even a generously spread sandwich uses less than half the bacon you’d put on a single BLT. 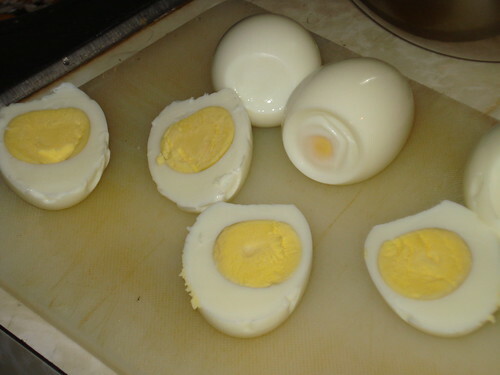 And the hard-boiled egg instructions were right on target, producing nicely yellow yolks (two were slightly tinged with green — I think those eggs were older — but not enough to affect the color of the filling). I don’t feel especially called to make either again, but I don’t specifically object to doing so.